What are those 6th Graders Doing? I saw something come across my Twitter feed today that made me smile. It was a retweet of a Facebook post that I assume has been making the rounds for a while now, I tend to be a bit behind the trends. It was a note that said, add “with a chainsaw” to the last book title you read. For me that would be The Trouble in Me… with a chainsaw! It’s almost funny read that extended title and then think about that rotten Gary Pagoda and all the trouble you can get yourself into with an amped up chainsaw. So I tell you this little anecdote to lead you into another book review as I finished The Trouble in Me last night. The book has all sorts of ominous warnings on the cover that I just glossed over, ready to read another memoir by the great Jack Gantos. I mean there is literally a gas can on the cover with the words “Keep out of the reach of children” printed right there in bold yellow font. I’m going to go out on a limb and guess this little book might make a few librarians and educators a bit nervous. I actually love that this book comes with a warning label. The Trouble in Me is Jack Gantos plumbing his sordid young life again, this time going back to his earlier childhood and delving into the question “where did I go bad, and why?” The book is a short little biography, just really covering one summer in Jack’s mid teen years. In this summer Jack’s family move to south Florida, Jack’s dad takes yet another job and Jack’s mother is pregnant. With all of these family dynamics swirling above Jack’s head like so many juggling balls, Jack meets his new next door neighbor, the wonderfully named Gary Pagoda. Gary is a villain and ne’re-do-well of the highest order, but like all good antagonists he is alluring, interesting, frightening and complex. He is the embodiment of every crime show character on TV, reality or scripted. Gary is bad to the bone and it is not long before the naive young Gantos is drawn in like a moth to a flame. Oh, and fire plays a really big role in this story, hence the gas can on the front cover and the burnt matches on the back. Soon enough Gary has Jack competing in the Pagoda Olympics, a series of student that almost read as fiction. I still don’t know if I truly believe Jack was launched over a house by a sling shotting tree and was able to land in a swimming pool and walk away without even a scratch! The story seems to be one bad idea and foolish mistake after another and I’m pretty sure that was Gantos’ whole point. He was looking for the source of his downward spiral and it seems this summer ended up as his ground zero. 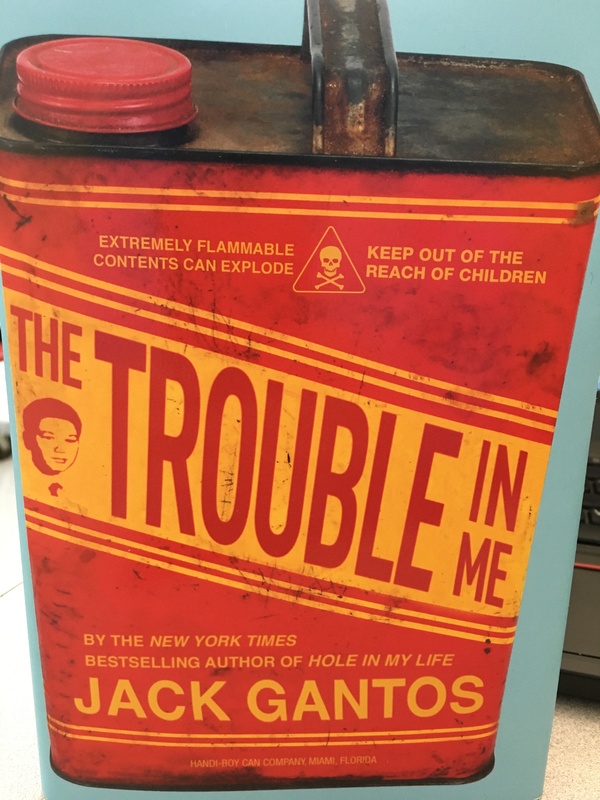 It’s strange for me to read The Trouble in Me and Hole in My Life because I was fortunate enough to meet Jack Gantos a few years back and he is a delight to hear speak, and he really is a funny and kind guy. He told me the next time I was in Boston to let him know and he would get me into the private, upstairs parts of the Boston Athenaeum, I was only able to check out the small rooms open to the public when I visited. So knowing the man Jack Gantos some and reading the character Jack Gantos confused me from time to time. How could this nice kid’s book author be a juvenile delinquent who decides to smuggle drugs into New York City and does hard time in the federal prison system? Wild how folks can change. I really like Gantos as a story teller and his voice will always be in my head when I read his work. This story is another fascinating life story that will shock you throughout. I also sort of enjoy the idea of the controversy this book could stir up in certain circles. It contains some salty language and no shortage of horrible and terrible stunts that would make just about any teacher of parent throw the book in the nearest dumpster. To me censorship at that level is an interesting dance. On one hand the teacher and the parent want the student to read, on the other they complain the story will be a bad influence. I don’t know if literature influences kids or not? I don’t know if kids copy what they read in fictional or autobiographical tales? I can’t say I’ve seen it. I can say that sometimes kids like to peek over the fence and watch the naughty kid on the other side, not as inspiration, but as an interesting case study. Sometimes kids want to read about other kids who don’t look, or act, or love, or believe like them. So I would never tell a kids don’t read Jack Gantos’ memoirs or Sherman Alexis’s stories or Lauren Myracle’s works. I just tell kids to be ready for a heaping does of life, and if that reality is too much, put it down, walk away, pick up something else (Archie comics always worked for me, they helped me get through the Aliens movie), but always keep reading. There is always something to read, sometimes it’s hard, sometimes it’s fun, sometimes it’s way above your level and sometimes it’s way below, but there is always something to read. It’s Going To Get Stinky!!! Today is a 6th Grade Chapter lunch time meeting and it is going to be gross! 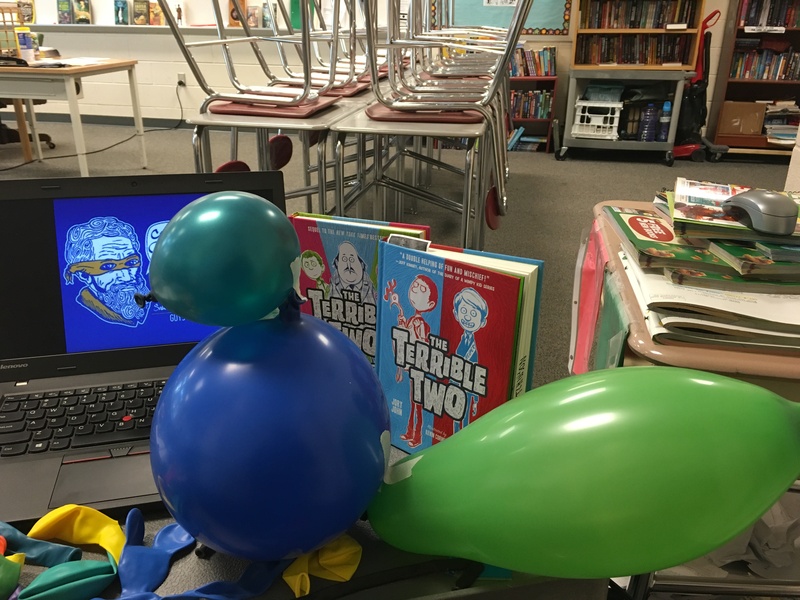 We have been talking about the second book in Mac Barnett and Jory John’s Terrible Two series, The Terrible Two Get Worse. In the opening prank Niles and Miles use a specific type of cheese to make Principal Barkin’s car smell of feet. EWWW! So today, at our lunch meeting remember, we will be attempting to consume a little Limberger cheese! I’m actually a little nervous that the smell will linger in my classroom. Check back soon to see some of our brave member’s reactions. It will be smelly, and it will be gross. So we cut the cheese (giggle) and did some big smelling and tasting. It was so bad the camera even got dropped! So if you liked our Limburger Challenge check back soon as we continue to read The Terrible Two Get Worse and the Sciurus carolinensis make a comeback.